Our heartfelt thanks to everyone who has joined the Lama Yeshe Wisdom Archive membership program with a donation of US$1,000. Your generosity helps bring the essential teachings of Lama Yeshe and Lama Zopa Rinpoche to readers all over the world. All Members have an account that uses their email as their username. If you had a Members Area account on our previous site, your password is still the same. You can click on any of the links below to access the teachings and images now available. If you are not yet a Member, please see our membership pages for more information about the benefits provided to members, and for information on how to join. Free access to a digital library of LYWA books in pdf and epublishing formats. Click here to view and download LYWA publications now available in digital format. 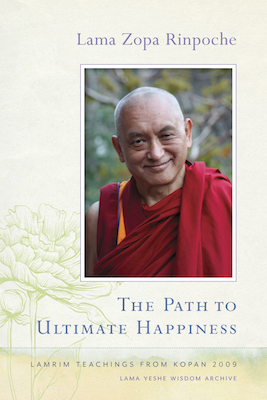 Our latest publication, The Path to Ultimate Happiness, by Lama Zopa Rinpoche, is now available as a free ebook for LYWA Members. Also freely available to Members: Abiding in the Retreat: A Nyung Nä Commentary, a revised 2018 edition of Teachings from the Vajrasattva Retreat and many more LYWA publications. 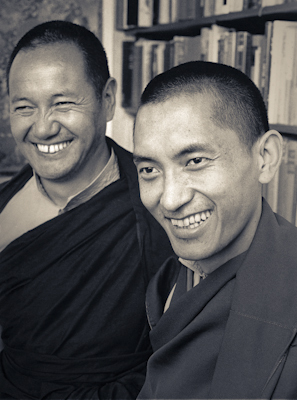 Free access to selected print quality images of Lama Thubten Yeshe and Kyabje Lama Zopa Rinpoche. The photos span several decades and include archival images from early teaching tours in the 1970s, through to more formal portraits. The high resolution images may be downloaded by members for personal use. Shantideva's Bodhicaryavatara (Guide to the Bodhisattva's Way of Life): Commentary by His Holiness the Dalai Lama, given as preliminary teachings to the Kalachakra Initiation in New York City from October 11th – 14th, 1991. 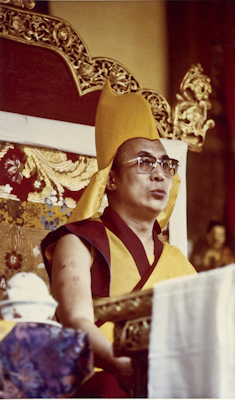 Preliminary Teachings, 1994: Transcript of teachings given by His Holiness the Dalai Lama as preliminary teachings to the Kalachakra Initiation in Barcelona, December 1994. The three-day talk covers topics such as the Two Truths, the Four Noble Truths and the nature of mind, and also includes daily question and answer sessions. The Four Noble Truths: Transcript of teachings given by His Holiness the Dalai Lama in London, 1996. The Thirty-seven Practices of Bodhisattvas: Commentary by His Holiness the Dalai Lama, given as preliminary teachings to the Kalachakra Initiation, Santa Monica, California, July 1989.